LinkedIn started as a wonderful tool to professionally develop with avenues such as social selling, recruiting and B2B advertising, but now it is in a dark place. Kind of like that place the Cleveland Cavaliers went after LeBron James left. This is our fault a lot more than LinkedIn's. They created this utopia of a professional network that a few social media super-villains ruined. These characters already ruined your inbox. Below are the characters in your LinkedIn network. The people who collect connections on LinkedIn like '90s kids -- and middle-aged men wearing tacky Hawaiian T-shirts today -- collect sports cards. Imagine the Connection Collector in the pre-LinkedIn era. They would probably hit up every office and shopping mall hounding successful-looking people for business cards. These homies are also on Twitter. The LinkedIn LION who has 5,000 connections. I don't think I've seen 5,000 people in a crowd before, let alone actually know them. Granted, I don't know exactly what 5,000 people in one place looks like. Sue me... I've never been to an Atlanta Hawks game (although that would be more like 3,000 people). The student who just can't wait to be king and thinks they're ready now. They message the CEO of every company looking for a job. Look, ace, I'm sure whomever you're messaging on LinkedIn would love to yell Hakuna Matata and have no worries for the rest of their days too. But they can't if you keep interrupting them.Try doing this instead. Don't ask someone you don't know for help (and realistically expect them to be able to). These people make you feel you're about to fight Carl Weathers or Mr. T. They littler your newsfeed with inspirational quotes about entrepreneurship, sales and subtle messages about changing jobs. Everyone needs inspiration once and a while. Once and a while being the key term. They rapidly post these quotes every five minutes. Imagine working with this person. They'd be too busy inspiring their LinkedIn contacts all day to do any work. You know this person goes home and binge-watches Rocky training montages all evening. Could you imagine this guy in a conference call? Bobba Fett - The hired goon that recruits people for jobs on LinkedIn. Headhunters in the offline world. These people scour LinkedIn looking for hard-to-find people to fill hard-to-find jobs. Think about people that are masters of a hard-to-find skill (know specific computer technologies, software platforms or how to dance with wolves during days of thunder). Kraven The Hunter - The master salesperson. They've conquered and hunted all the game in the new business jungle... and you're next. This sales-person handpicks their targets, leverages personal information we put on LinkedIn to find common ground and plays to our self-interest in order to win business. They are dangerous and diabolical because they lead with our passions (where we went to school and favorite hobbies) to get a response. LinkedIn calls them social sellers. These are 10 people we wish Kraven well in finding. The small percentage of LinkedIn users that actually pay for their accounts. They are the only people that use all of LinkedIn's services too. Even the "Request Introduction" feature. Sure, Uncle Phil! Even though I don't really know you, I'd be happy to introduce you to my "connection" Aunt Jane (I don't really know her either). The millions of us that get to use LinkedIn for free because of the 1-2,000 Uncle Phils out there. The person you had one forgettable eight-minute call with, but now it's the call you'll never forget since they added you on LinkedIn afterward. Now you're stuck with their updates being emailed to you ("See Jane Salesperson's latest post") regularly for the rest of your life. LinkedIn is happy to remind you on Sunday morning when the One-Call Wonder does the LinkedIn equivalent of changing their shoes ("Johnny Jobseeker posted something you aren't interested in on a group you don't want to join!"). People who post everything Richard Branson says on LinkedIn. The person who sets their profile to "Anonymous profile characteristics." This isn't fooling anyone. How many people do you really know that mow lawns in the Sahara Desert and love food that ends in "amburgers"? The person who wrote this programming algorithm would be a lousy Secret Santa. The person you barely know that still endorses you for various skills. What's creepier is that The Fan also endorses you for skills you don't have. This sets off a chain reaction of other people endorsing you for something you know nothing about. According to 10 people, I know a lot about Animal Welfare. I know nothing about Animal Welfare. I know animals exist (mostly in the jungle or in my garden and hopefully not in my house) and need care, but that's about it. You've all seen Russell Crowe's depiction of John Nash. Now meet the one in your LinkedIn profile. 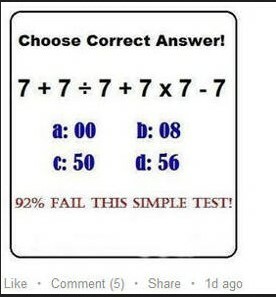 They post math problems and bait you into answering by implying only geniuses can get this arithmetic question right. The irony is that there is usually a grammatical error in the image. The person whose job title is more dramatic than a Bollywood movie. They aren't a "Mattress Tester," they are "improving the way the world rests and rejuvenates." These people are also "thought leaders." I think most people lead their own thoughts from time to time. You know, when they are not being dictated to them by LinkedIn Influencers or wannabe-LinkedIn influencers. I enjoy my time on LinkedIn and a lot of other people do too as it's a great tool for personal branding. Let's all make a scouts pact to use our presence on LinkedIn to make the world a better place. There's hope still! The night is darkest just before the dawn. And LeBron did go back to Cleveland. This piece of business humor is also available on The Huffington Post.